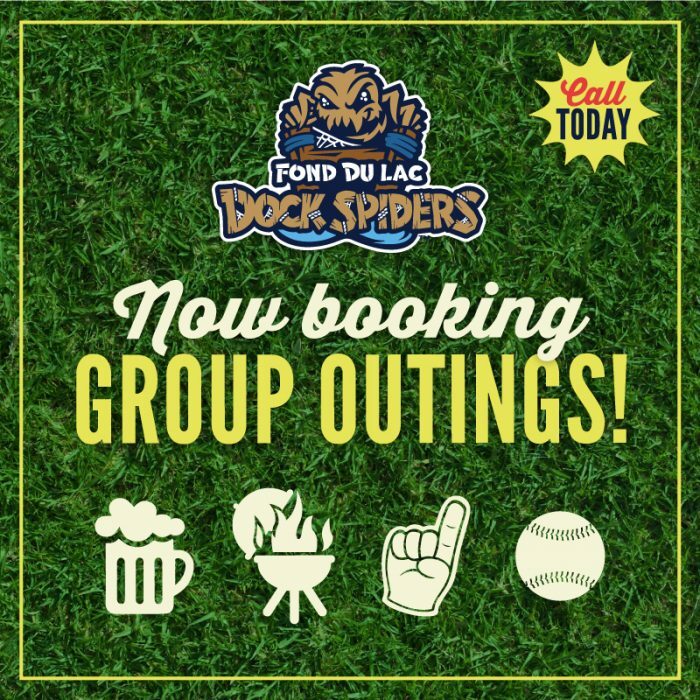 FOND DU LAC, WI – The Fond du Lac Dock Spiders have scheduled giveaways, theme nights, and special appearances to go along with many of their home games during the 2018 season. They are set to unveil their Promotional Calendar to allow you to prepare to pick out your favorite games for when individual game tickets go on sale at 10:00am on Saturday, May 5. The Fond du Lac Dock Spiders have put together seven games with giveaways as part of a mini-season ticket package. If you purchase one of these Souvenir 7 packages, you will be guaranteed to receive each of the following items. If you do not purchase a Souvenir Seven package, you will have to be one of the first 500 fans (Unless otherwise indicated) to attend the game that day to receive the giveaway! Thursday, May 31: OPENING DAY! All fans will receive a Dock Spiders Zipmate that can be attached to your backpack, shoelaces, or sunglasses. Saturday, June 2: Local Heroes Night – We want to honor all the local emergency service personnel. All police, firefighters, and EMS can purchase half-priced box seat tickets at the ticket office for their entire family. Members of the hit show, Paw Patrol, will also be in attendance. Monday, June 4: School Day/Field Trip Day – A special start time of 11:35AM provides the perfect opportunity for school groups to come out to the ballpark. All school groups will receive a discounted ticket rate. Contact Director of Tickets, Chris Ward, at cward@dockspiders.com for information or to order tickets. Wednesday, June 13: Girl Scout Day – Discounted tickets are available for Girl Scout Troops on this date. All Girl Scouts attending the game may participate in a pregame parade on the field. Contact Director of Tickets, Chris Ward, at cward@dockspiders.com for information or to order tickets. Saturday, June 16: Superhero Night with an appearance by Spider-Man and The Flash – Your Friendly Neighborhood Spider-Man is swinging through Fond du Lac for a stop at this Dock Spiders game. Meet everyone’s favorite web-slinging, wall-crawler along with The Flash! Sunday, June 17: Father’s Day – A perfect day to bring your father to the ballpark! The first 500 fans will receive a BBQ Grill Set presented by Quad Graphics. Wednesday, June 20: Boy Scout Night – Discounted tickets are available for Boy Scout Troops on this date. All Boy Scouts attending the game may participate in a pregame parade on the field. Contact Director of Tickets, Chris Ward, at cward@dockspiders.com for information or to order tickets. Thursday, June 21: 90’s Night – Grab your snap bracelet and Nintendo 64 to come celebrate the 1990’s! Friday, June 22: Minion Night – The best henchmen in the world are coming to the ballpark! The Dock Spiders have invited the Minions back to the ballpark, and you will be able to meet them. Monday, June 25: Bark in the Park – Here’s your opportunity to enjoy a Dock Spiders game alongside your favorite pup. The Boat Launch will be opened up to individuals who want to bring their furry friend to the game. Tickets are $15 for humans and dogs are free. Tickets include ticket to game with seating in the Coors Light Boat Launch, all-you-can-eat food and soda. Only 50 human tickets will be available. Thursday, June 28: Girls Night Out – A night just for the ladies. There will be samples from local retailers and drink specials as well! Come out for this fun evening presented by Floorquest. Friday, June 29: Agriculture Night presented by Agromatic and Rosendale Dairy – Celebrate the agricultural heritage of the community and the first 500 fans will receive a cow pattern mini helmet! Wednesday, July 4: Military Appreciation Night presented by Horicon Bank – The Dock Spiders will honor all those who served in our military by offering a free ticket to active and retired military personnel. A military ID or proof of service can be presented at the Dock Spiders ticket office to receive the free ticket. Saturday, July 7: Star Wars Night – No need to go rogue because Star Wars Night is coming to the ballpark! Meet your favorite characters before and during the game. The Dock Spiders will wear special Star Wars themed jerseys that will be auctioned off with proceeds going to the Fond du Lac United Way. Tuesday, July 17: Game Night with Angry Birds Appearance – You won’t need a controller or gaming system to enjoy this fun night at the ballpark. Wednesday, July 18: Christmas in July – Celebrate Christmas without the snow for Christmas in July at the stadium. The Salvation Army will have their red kettle at the ballpark as well for collecting donations. Thursday, July 19: Outdoors Night – Get ready for a little hunting and fishing at the stadium! The first 500 fans age 21 or older will receive a camouflage can coozie courtesy of Budweiser. Friday, July 20: Princess Night – Three storybook princesses will come to the ballpark to meet fans and pose for pictures during the game. Friday, July 27: Weaver’s Birthday Party – Come celebrate Weaver’s birthday along with many of his other mascot friends! Friday, August 3: Harry Potter Night – It doesn’t matter which House to which you belong, you can celebrate the books and movies at the stadium on this night! Saturday, August 12: Fan Appreciation Night – The Dock Spiders will say “Thank You” to fans with some surprises for the last regular season home game. The first 500 fans will receive a poster featuring the 2018 team. Season ticket packages and group outings of 20 or more for the 2018 season are on sale now and may be purchased from the Dock Spiders ticket office. Fans may order over the phone by calling (920) 907-9833 or any time in the ticket section of dockspiders.com. The Fond du Lac Dock Spiders are a member of the finest developmental league for elite college baseball players, the Northwoods League. Entering its 25th anniversary season, the Northwoods League is the largest organized baseball league in the world with 20 teams, drawing significantly more fans, in a friendly ballpark experience, than any league of its kind. A valuable training ground for coaches, umpires and front office staff, 190 former Northwoods League players have advanced to Major League Baseball, including three-time Cy Young Award winner Max Scherzer (WAS), two-time World Series Champions Ben Zobrist (CHC) and Brandon Crawford (SFG) and MLB All-Stars Chris Sale (BOS), Jordan Zimmermann (DET) and Curtis Granderson (TOR). All league games are viewable live via the Northwoods League portal. For more information, visit www.dockspiders.com or download the new Northwoods League Mobile App on the Apple App Store or on Google Play and set the Dock Spiders as your favorite team.